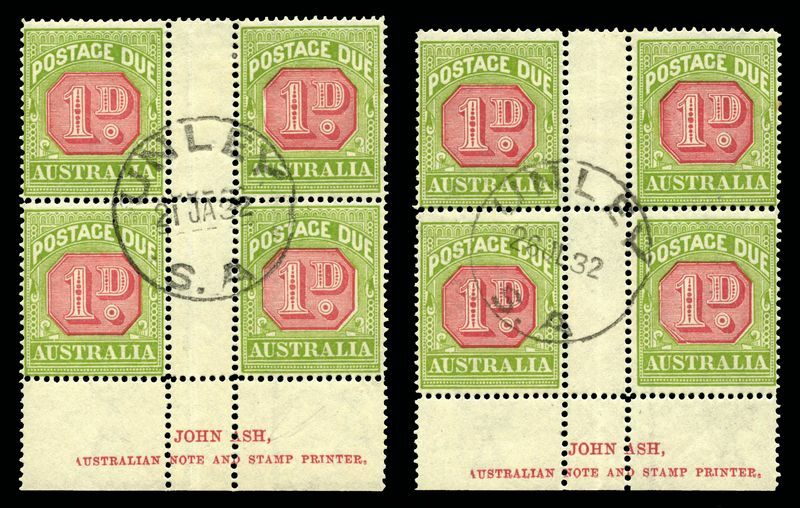 1922 1d Carmine and Yellow Green Ash imprint block of 4 with one unit having variety "Left frame of value tablet broken at base", additionally left frame largely missing at base, not mentioned in the specialist catalogue, another unit with variety "Left frame buckled in centre, with break above" CTO with gum. Also a similar block showing the final stage of the variety "Left frame of value tablet broken at base", another unit with variety "Left frame buckled in centre, with break above, with a additional scratch in lower left corner" CTO with gum, the top right unit with one toned perf. ACSC D106zb and D106zc. Catalogue Value mint $450.00.